Winterfest Ice Rink in Kiener Plaza. Skating begins Saturday, November 17th and runs through Monday, January 1st (see hours below). Skate rental is $12 for adults; $7 for children ages 3-15; rink entry is FREE. See website for more information on ALL the activities! 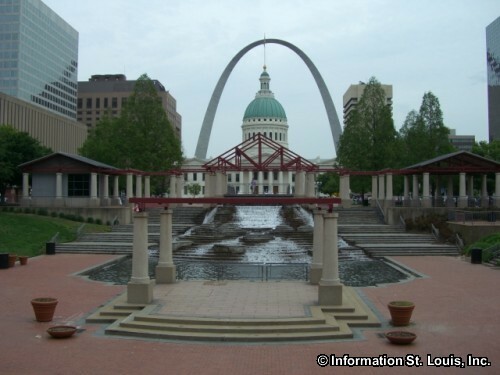 Kiener Plaza is part of the Gateway Mall that runs down the center of Downtown St. Louis and features the Morton D. May 500 seat amphitheater and the Kiener Memorial Fountain and Runner Statue. Kiener Plaza is host to many events that take place in Downtown such as the Opening Day Pep Rally for the Cardinal Baseball team, concerts, and the starting point of the annual Thanksgiving Day Parade. Directions: Located at the intersection of Broadway and Market Street, just west of the Old Courthouse, in Downtown St. Louis. Kiener Plaza is bordered by Broadway to the east, Chestnut Street to the north, 7th Street to the west, and Market Street to the south.